Kitimat votes: High turnout expected for Gateway ballot but what will the results mean to Kitimat? A high turnout is expected Saturday for the non-binding plebiscite where residents of the District of Kitimat can, perhaps, say yes or no to the Enbridge Northern Gateway project. In some ways, it all depends on how people interpret the convoluted question. 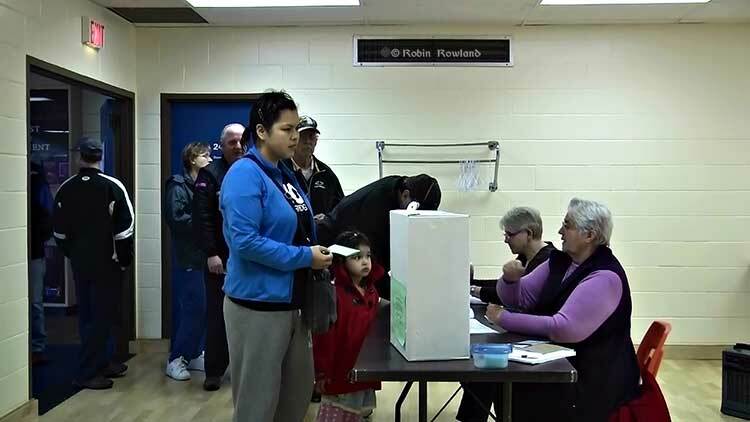 Warren Weychasen, Kitimat’s Deputy Administrative Officer said Thursday 910 people voted during advance polls on April 2 and April 9, compared to 470 over the two days of advance voting in the 2011 municipal election. Even who can vote has can be the matter of heated debate. Members of the Haisla Nation who live in Kitamaat Village feel strongly that they should have a voice, even though legally they live outside the municipal boundaries. “It’s our land they’re talking about,” one Haisla member, who wouldn’t give his name, said Friday as he was getting off the Village bus at City Centre. The District also decided to allow residents of Kitimat who have been here longer than 30 days to vote, even if they are not Canadian citizens. Another group that can’t vote, many from outside the northwest region, are living at the Rio Tinto Alcan Kitimat Modernization Camp or at smaller camps for the developing LNG projects. An informal poll of those workers at City Centre Friday showed that if camp workers had been allowed to cast a vote, many would have voted “yes,” something the opponents of Northern Gateway said they feared would overwhelm local residents. The $6.5 billion project would see two pipelines, one carrying oil sands bitumen from Alberta to the port of Kitimat, and a second carrying a form of natural gas used to dilute the bitumen from Kitimat to Alberta. The bitumen would then be loaded onto tankers for shipment to Asia along environmentally sensitive areas of the British Columbia coast. Northern Gateway’s campaign has concentrated on the promise of 180 permanent direct local jobs worth $17 million and more spinoff jobs for contractors and suppliers. The company also promises that the District will receive $5 million in property taxes. Northern Gateway also emphasized its commitment to safety and the environment, saying that the National Energy Board Joint Review Panel that held two years of hearings on the project, has made many of the company’s voluntary commitments a mandatory part of the conditions for granting permission to go ahead. The main opponent, Douglas Channel Watch, maintains that the risk from either a tanker accident or pipeline breach is too high for the small number of jobs Northern Gateway will bring to the community. 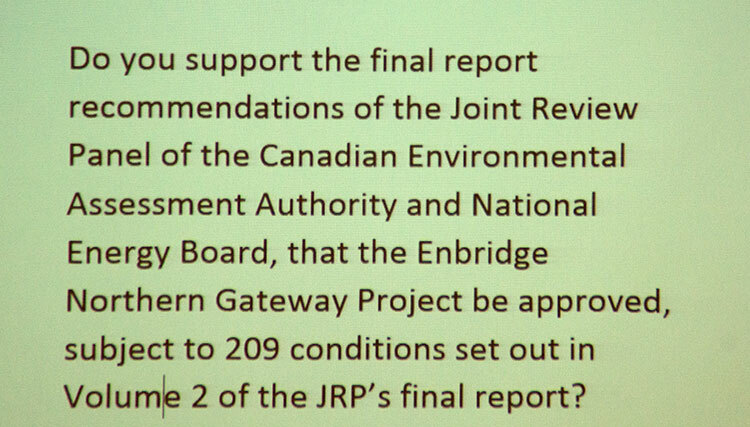 Do you support the final report recommendations of the Joint Review Panel (JRP) of the Canadian Environmental Assessment Agency and National Energy Board, that the Enbridge Northern Gateway project be approved, subject to 209 conditions set out in Volume 2 of the JRP’s final report? After the district council decided on that question, debate on the wording continued through several council sessions in January and February. Public delegations, some from Douglas Channel Watch, told council that there should be a simple yes or no question. Council rejected a proposal for a series of simple of questions, leaving voters to decide on whether or not they supported the Joint Review recommendations. That raised the question of whether voters would make their choice on some of the provisions of the report and not the project itself. That means that even Council is unsure of what the vote will mean. The main reason for holding the non-binding plebiscite is that it fulfills a promise from an all candidates meeting during the municipal election in November 2011, where every candidate agreed to “poll” the citizens of Kitimat on Northern Gateway. After the new council took office, on Jan. 16, 2012, it voted to hold some sort of poll or vote to find out whether the community supports the Enbridge Northern Gateway pipeline project. At the time, it was unclear after the vote how the survey would take place. For the almost two years of the Joint Review Panel, the District of Kitimat did little more than act as spectators when the JRP was in town, claiming its neutrality policy precluded participation. The debate in the District of Kitimat Council on March 3 showed that even members of council were uncertain what the vote would mean. Councillor Corinne Scott said, “As much as we wanted to know what the feeling of the community is, all we know so far is that we’re split. What the percentage of split is, we don’t know,” said Scott. Councillor Edwin Empinado said once the results are known, that would give the District “more bargaining power” in future dealing with company and the federal government, a sentiment echoed by Douglas Channel Watch which admits the vote will do little more than send a message to Ottawa. 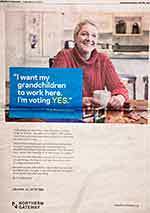 It was Northern Gateway’s decision to put major resources into the campaign that raised the profile of what was originally intended as way of discovering the feeling in the small community. With the ruling from the Joint Review Panel that Northern Gateway is in the national interest and the final decision in the hands of the federal cabinet, it is equally uncertain what effect, if any, the vote will have on Ottawa. Throughout the hearings, most people in Kitimat kept their views to themselves. When the campaign began in earnest, which in turn, triggered a fierce and often acrimonious debate on social media, mainly on the Facebook group Kitimat Politics, showing the divide in the community, although it appears from the comments that there are more opponents than supporters on the forum. The e-debate on Kitimat Politics is continuing up to the last minute Friday night and will likely get hotter once the results are known. The adversarial feeling that van Dyk had said the company wanted to avoid was amplified in the past month when Northern Gateway began an aggressive public relations campaign with newspaper ads, glossy brochures and a door-to-door campaign by employees, some brought in from Alberta. 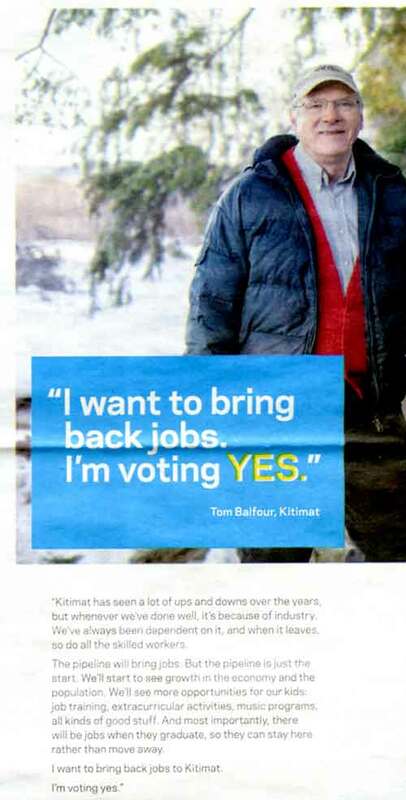 When news of Northern Gateway’s campaign effort spread on social media, which in turn prompted a counter campaign using the hashtag #adsforkitimat. Ads created by people from across BC were posted on Facebook and YouTube. Douglas Channel Watch positioned itself as the David vs. the Enbridge Goliath. 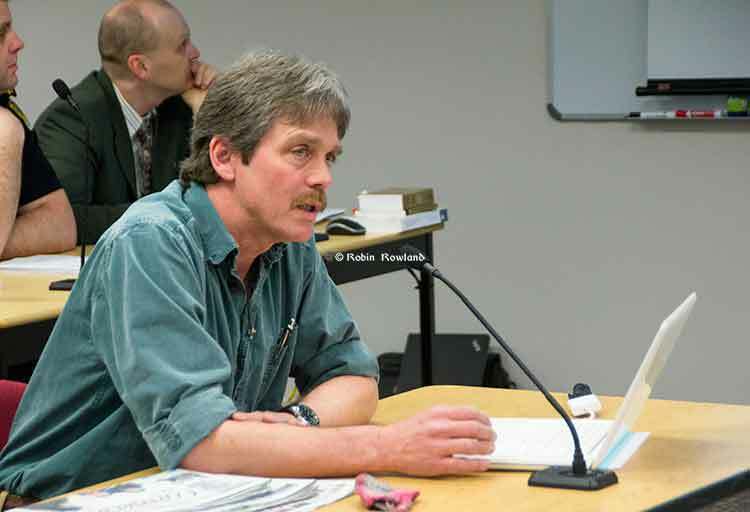 On Monday, Murray Minchin of Douglas Channel Watch told Council, “When Kitimat and northern BC residents found out how many resources Enbridge was pouring into their Kitimat plebiscite advertising campaign, some of those citizens made unsolicited donations to Douglas Channel Watch. This has allowed our small group to mount an advertising campaign of our own.” Minchin said donations went up after the group launched a website adding, “People began handing us money on the street while we were putting up lawn signs. Somebody, anonymously, left a $2,000 money order in one of our member’s mailboxes. On Thursday, Douglas Channel Watch released its advertising budget showing that the organization spent $10,970.00 on print media ads, $792.92 on supplies, and has an outstanding debt of approximately $2,600.00 in radio ads, for a total of $14,362.92. Minchin challenged Enbridge to release its own ad budget. Ivan Giesbrecht, a spokesperson for Northern Gateway said in an e-mail to the media that the company “will discuss our advertising spending after it’s over [the plebiscite] this weekend.” Late Friday, Giesbrecht released partial figures to the Northern Sentinel, saying the company had spent $6,500 in print and $3,100 on radio advertisements during the campaign. Those figures don’t include the glossy brochures Northern Gateway distributed in the community, sponsored posts on Facebook, or the signs the dot the streets of Kitimat. Douglas Channel Watch did put up signs. Many were recycled from earlier protests, came from Friends of the Wild Salmon or were created by volunteers from as far away as Smithers. Giesbrecht told the Sentinel said the company felt that the discussion in the community about which side of the vote has spent more had “become a distraction” from the real issues. But instead of a discussion on jobs and taxes, on Friday night there was a raging debate on Kitimat Politics on Facebook about the Gateway release on its spending and what was missing from those figures. On a cold and rainy Tuesday afternoon, Northern Gateway hosted an Open House and barbeque at the Rod and Gun. Northern Gateway not only outlined the jobs they say the project would create, but emphasized how far along the company is coming in meeting BC Premier Christy Clark’s condition for a “world-class” tanker spill prevention and response system. 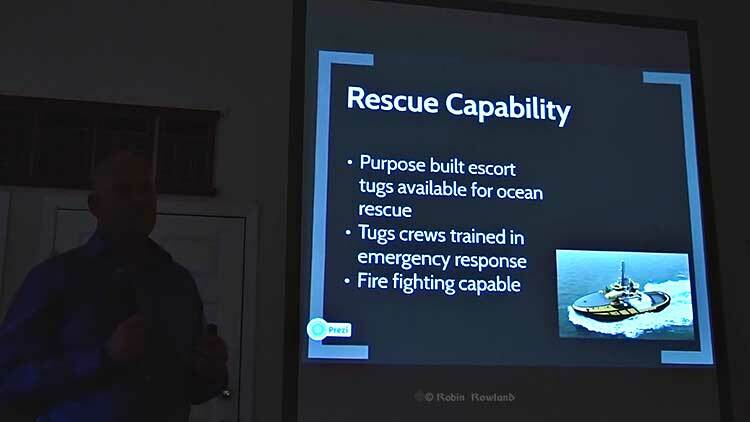 Owen McHugh, a Northern Gateway emergency manager said, “Adding these four or five tugs to the north coast provides a rescue capability that doesn’t exist in this format. So for any large commercial vessel that is traveling on our coast, this capacity to protect the waters of the north coast.” The tugs will also have firefighting capability. “The salvage capability that BC describes as ‘world-class,’ Northern Gateway is bringing that to the north coast,” McHugh said. The plebiscite has raised tensions between the District of Kitimat and the nearby Haisla First Nation, which adamantly opposed to Northern Gateway. Deciding to hold a referendum at this late date is a slap in the face to all the work done by the Haisla Nation on this project. 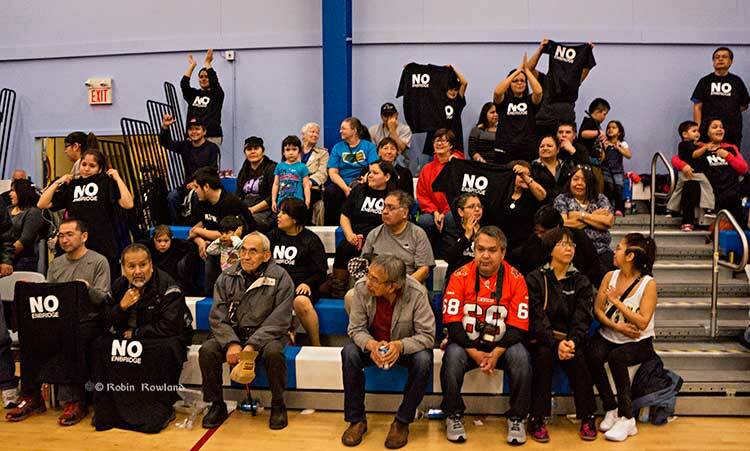 The Haisla Nation dedicated time and money toward testing Northern Gateway’s evidence and claims about safety and environmental protection, while the District stood by and did nothing. The review process for this project has already left town, with the District taking no position on the project. Still undecided on what its views are on the project, the District now proposes to conduct a poll, instead of examining the facts in the JRP process. A poll to vote on a JRP report that we view as wrong to begin with including the flawed process itself! Monaghan has said the council will wait for the outcome before taking a stand. District Council has called a special meeting on Monday night to consider the results of the plebiscite. For years the District of Kitimat has been officially neutral but voting over the past years shows that council is evenly split on Enbridge issues with swing votes sometimes going one way and sometimes another on what are often four to three votes. The federal cabinet has until mid-June, 180 days after the release of the Joint Review decision to approve the panel’s findings. It is expected by most observers that Prime Minister Stephen Harper will give the go ahead. That doesn’t mean the project will start immediately, the Joint Review findings already face about a dozen court challenges from First Nations and environmental groups. Minchin said Saturday’s non-binding plebiscite “is not going to affect the Prime Minister’s decision per se. But it’s very important for Enbridge to squeak out a win here in Kitimat. It’s just my feeling that this proposal is associated with way too many risks for very little gain. No matter what happens Saturday, both sides will continue to push their positions. How Kitimat voters cast their ballots depends on factors that go beyond the simple environment versus economy and jobs argument, so the outcome of Saturday’s plebiscite is far from certain. In 2010, West Fraser’s Eurocan paper mill closed, with the loss of 500 jobs, a devastating blow to Kitimat’s economy. The Eurocan closure, the earlier closure of a Methanex plant and cutbacks at the Rio Tinto Alcan smelter and the abandonment of mills and mine across the northwest in recent years have left many people skeptical of corporate promises of jobs. Others believe the Northern Gateway project, along with proposed Liquefied Natural Gas projects in Kitimat and Prince Rupert will bring a much needed boost to a struggling economy. Even though Kitimat has been an industrial town since the aluminum smelter was built in the 1950s, most residents fish in the Kitimat River, boat on Douglas Channel and hike or hunt in the back country, which means environmental concerns are always high on the agenda. There are fears even among some supporters of Northern Gateway of an environmental disaster. Northern Gateway, which has admitted that its relations with northern communities started off badly in the early stages of the project, has a lot of catching up to do, no matter what the outcome of the plebiscite. Nathan Cullen, NDP MP for Skeena Bulkley Valley and Opposition Finance Critic came to Kitimat last week to assist Douglas Channel Watch with its door-to-door campaign. “There will be PhDs written on how Enbridge blundered this,” Cullen told reporters at the time. Author Robin RowlandPosted on April 11, 2014 April 12, 2014 Categories dilbit, District of Kitimat, Enbridge, First Nations, Haisla, Joint Review Panel, Kitimat, Nathan Cullen, Northern Gateway Pipeline, Pipelines, Politics & Government, referendum, safety, search and rescue, Skeena - Bulkley Valley, Smithers, voteTags BC, Business, Douglas Channel, Douglas Channel Watch, Enbridge, environment, First Nations, Haisla, hearings, Janet Holder, Joint Review, Kitimat, Murray Minchin, Northern Gateway, ocean, oil spill, Pipelines, plebiscite, Politics & Government, referendum, tanker, tugs, vote1 Comment on Kitimat votes: High turnout expected for Gateway ballot but what will the results mean to Kitimat? 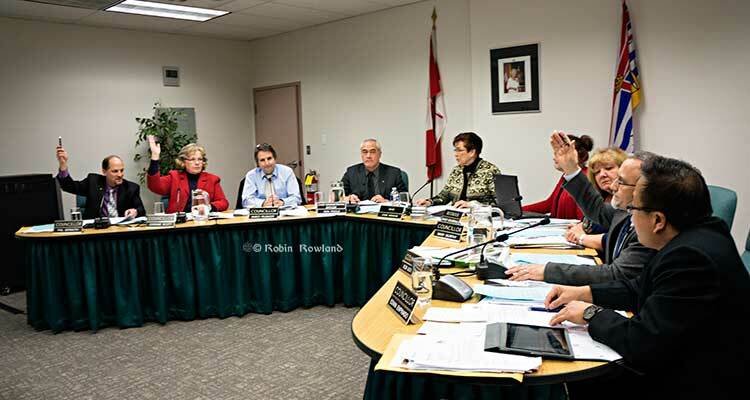 Editorial (I) Kitimat Council, major league or bush league? Monday’s District of Kitimat Council meeting was a display of mind-numbing, stubborn political mule-headedness. After a couple of hours of procedural wrangling, confusion over motions and often just plain dumb discussion, four of the seven members of District Council ignored the recommendations from District staff and suggestions from public delegations, and with their majority decided to stick with the confusing, convoluted Enbridge Northern Gateway Plebiscite question for the vote on April 12. In May 2012, at the time of the first omnibus bill, Northwest Coast Energy News compared Kitimat Council to a Junior B team up against the NHL All Stars. We hereby apologize to every Junior B player, coach, trainer and referee across this country for comparing them to Kitimat Council. For a community that is in the “bush” one hesitates to use the pejorative term bush league. But in this case the term is correct. District of Kitimat Council is like a bush league beer team playing against the NHL All Stars. Kitimat has to deal with the major leagues– that is the world’s biggest corporations, Shell, Chevron, Apache, Mitsubishi, PetroChina, Korea Gas, not to mention Rio Tinto. And then there’s Enbridge. Kitimat has to deal with a federal government that sees Kitimat as nothing more than an expendable pawn in Conservative economic and reelection strategies and the province of BC, which under Premier Christy Clark, sees Kitimat as a goose laying golden eggs – as long as most of those eggs go south to the Lower Mainland. The Haisla Nation, now under the leadership of Chief Counsellor Ellis Ross, on the other hand, has acted like a top level team (whether NBA or NHL) in dealing with the world’s biggest companies and acted on behalf of the Haisla’s best interests. Ross has not been afraid to admit, on the record, with main stream media interviews, that sometimes he and the Haisla Nation Council have made mistakes in dealing with transnational corporations. But Ross has said he and the HNC learn from those mistakes and do better next time. There appears to be a good working relationship with the Haisla and the companies working to develop Kitimat. Neither side gets everything but the relationship is there. Now the Haisla have gone to the Federal Court of Appeal and filed an extensive challenge to the Joint Review Panel report, outlining what the Haisla believe are serious flaws in the Joint Review Panel, including asking the court to find that the JRP did not follow requirements of the Canadian Environmental Assessment Agency, while the Kitimat plebiscite presumes the JRP did follow CEAA rules. Kitimat Council has yet to learn anything from its on going sorry record of making mistake after mistake. If those council members who voted for the confusing ballot thought that their actions would do anything to unite this community, they were wrong. They’ve already alienated everyone on both sides of the issue who wanted a simple Do you support the Northern Gateway project yes or no question? Just what does the question mean? Are you in favour of the Joint Review Panel? Or you in favour of Enbridge Northern Gateway? Both? Neither? What if you support Enbridge Northern Gateway but believe the JRP has no credibility? (There are people in Kitimat who are quietly saying that—they support Northern Gateway but have no trust in the JRP or the federal government to enforce the conditions. There are others who say the JRP did a good job and still oppose Northern Gateway). What if you are in favour of 50 or 150 of the JRP recommendations but oppose others—like the use of temporary foreign workers? Rather than two sides with an uncertain middle, there are now multiple sides, with an even more uncertain muddled middle. When asked Monday night what Council would do with the question, the response was incoherent. It could depend on voter turn out. What happens if the turn out is low because the public doesn’t understand the question? What if the turn out is less than the last municipal election? More? What if the turnout is 90 per cent but a majority vote undecided? Could construction workers who may be eligible to vote because they’ve been here for six months but have no stake in the community overwhelm the votes of long time residents? Council refused to say whether a simple majority of 50 per cent plus one yes or no (not counting undecideds) is sufficient to decide the issue or whether some super majority, 60 per cent 66 per cent or 75 per cent will mean something? How are Council going to decide? Are they going to decide now or after the vote? Once Council has the vote in hand, what do they do with that vote? Oppose Enbridge if the vote is a majority no? Welcome Enbridge if the vote is yes? Or just keep on doing nothing? (which is not being neutral). Ask any business analyst and the one thing they will tell you is that business hates uncertainty, uncertainty means hesitation to invest, hesitation to commit. Kitimat Council has just made everything more uncertain than ever. Business will take note. Big league games mean big league coverage. 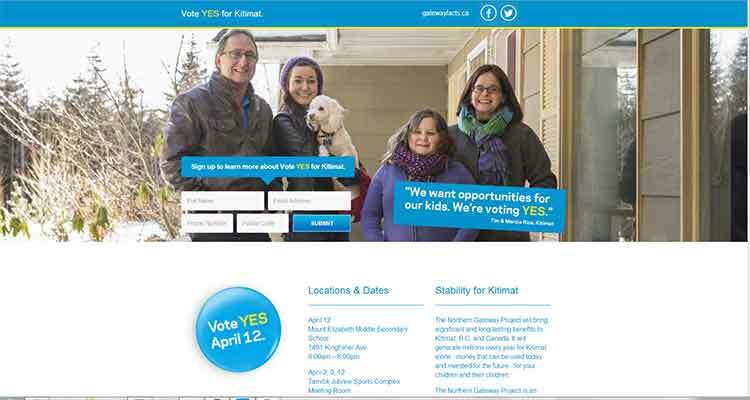 I know from colleagues that not only the national media, but major international media are considering coming to Kitimat for the April 12 plebiscite. The vote is a “news peg” that lets media that haven’t been covering Kitimat on a regular basis bring their readers and viewers up to date on an important story. If Kitimat Council is incapable of explaining the plebiscite question to the people who actually live here, how can Kitimat’s politicians explain the question to a fly-in reporter who has never been to British Columbia and who, at this moment, probably thinks JRP is an energy drink? How does a viewer or reader in New York, London, Sydney or Tokyo understand what people here are voting for or against, if the people here don’t understand it? A possible plebiscite debacle seen on 24 hour satellite channels and read on millions of tablets and phones (as well as surviving newspapers) around the world won’t do much for Kitimat’s reputation for political competence and ability to play well with others. The world’s business community will take note of that. The word bush league comes to mind. There was one intelligent, last minute suggestion about the Enbridge Northern Gateway plebiscite question at Monday’s council meeting, a solution to the conundrum of a proper question, but one that the stubborn council is unlikely to adopt. Patricia Lange was not a scheduled delegate. She came forward after Mayor Joanne Monaghan asked it there was anyone else with a comment. In our view, Lange has hit on the ideal solution. While the proponent, the Enbridge Northern Gateway company should not be included in deciding the wording of the plebiscite question, the Kitimat Economic Development Association, which generally favours the project, should be. District Council wasn’t involved the Joint Review Process. They should have been but they weren’t. Right now most on Council are handling the JRP like a student who skipped every class for two years and is now desperately cramming for a final exam. Both Douglas Channel Watch and the Kitimat Economic Development Association, on the other hand, have been deeply involved in the Northern Gateway issue since the beginning and either participated in or closely followed the JRP. Over the past couple of years, Northwest Coast Energy News has spoken both on the record and on background to members of DCW and KEDA. Both groups are not that far apart. Both members of DCW and KEDA have told me, independently and without knowledge of their opposite numbers are saying the same thing, that they want an economically prosperous, healthy and environmentally viable future for their grandchildren in Kitimat. They just disagree on how to get there. KEDA members have said they want proper, enforceable but economically viable environmental restrictions on any industrial development in this region. DCW members have repeatedly said they do not oppose industrial development as long as it respects the environment. In an ideal world, the District would follow Lange’s suggestion and appoint three members of DCW and three members of KEDA to come up with a proper question or questions. District Deputy CAO, Warren Waycheshen, who is an excellent facilitator, could be the chair of the committee and keep things moving. That committee could probably come up with questions acceptable to the entire community on a retreat lasting just an afternoon. It’s not an ideal world. The District of Kitimat has a highly competent staff who prepared reports to council on the plebiscite, reports that were ignored and rejected. Delegations, most admittedly from the environmental side, appeared before council to argue for a simple question and presented persuasive and eloquent arguments that were brushed off. Council spent some time Monday night trying to define the term “leadership.” In the end they decided that leadership was staying in their silos and refusing to deal with big league questions. Council is bush league, that is why they won’t take the risk of adopting Lange’s suggestion for the advocates of both sides to meet, do their civic duty and draw up unbiased questions. After Monday’s debacle, there is already a lot of talk on social media about “throwing the bums out.” It’s a little early for that. District of Kitimat Council has a few months for members to prove that they are worthy of being called up to the majors, to become (to borrow Christy Clark’s phrase) a “world class” council. If councillors show over the coming months that they are not up to the job, the time will come in the November elections to vote for competent candidates for council who are ready to play in the big leagues (if there are actually candidates who have major league potential willing to run). Author Robin RowlandPosted on January 22, 2014 January 23, 2014 Categories BC, Canada, Douglas Channel, Enbridge, First Nations, Haisla, Joint Review Panel, Kitimat, Northern Gateway Pipeline, PipelinesTags BC, Douglas Channel Watch, economy, Enbridge, environment, First Nations, Haisla, hearings, Joint Review, Kitimat, Kitimat Economic Development Association, Northern Gateway, Pipelines1 Comment on Editorial (I) Kitimat Council, major league or bush league? 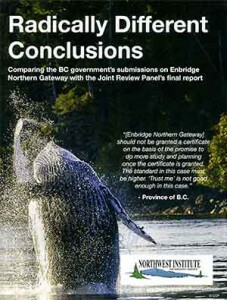 The government of British Columbia has filed a harsh assessment of Enbridge Northern Gateway in its final arguments submitted May 31 to the Joint Review Panel—much harsher than the government press release giving notice of the rejection suggests. “‘Trust me’ is not good enough in this case,” the filing by BC government lawyer Christopher Jones says of Enbridge’s plans to handle any possible disaster from either a pipeline rupture or a tanker spill. Some of the arguments from the province’s lawyers echo points about the Kitimat Valley raised by Douglas Channel Watch and the Haisla Nation, at one point, pointing directly to evidence from Douglas Channel Watch’s Dave Shannon. The news release repeats Premier Christy Clark’s five conditions for the Northern Gateway and other projects, putting a positive spin on the much harsher legal argument. The provincial government has established, and maintains, strict conditions in order for British Columbia to consider the construction and operation of heavy-oil pipelines in the province. While the Joint Review Panel (“JRP”) may of course consider other factors in its recommendation, the Province submits that the JRP must accord very significant weight, in the case of this project, to the fact that NG’s plans for terrestrial and marine spill response remain preliminary and that it cannot, today, provide assurance that it will be able to respond effectively to all spills. Given the absence of a credible assurance in this regard, the Province cannot support the approval of or a positive recommendation from the JRP regarding, this project as it was presented to the JRP. In the alternative, should the JRP recommend approval of the pipeline, the JRP must impose clear, measurable and enforceable conditions that require NG to live up to the commitments it has made in this proceeding. Overall the province appears to accept the arguments from Douglas Channel Watch and other environmental groups that geo hazards along the pipeline route present a significant risk, one perhaps underestimated by Enbridge Northern Gateway. The Province has concerns about the assertions NG has made regarding the probability for full-bore releases resulting from geohazards. NG asserts that full-bore spills will be very rare. However, this assertion must be considered in light of the fact that NG’s analysis of the geohazards that the pipeline could face is at a preliminary stage…. The rugged topography of West Central British Columbia is prone to slope failures. Terrain instability may pose significant challenges for linear development. The province’s arguments also indicates that Enbridge Northern Gateway has not done a good enough job regarding spill response, whether from a full bore rupture or a pin hole leak. NG stated that [a] table [in the evidence], which includes probabilities for medium sized spills, would be “replaced by. a detailed characterization of each pipeline kilometre and region as part of the ongoing risk assessment work,” but the province says, a later table that “now replaces the concept of large and medium spills”. focussed only on full-bore releases, a relatively rare event. Premier Christy Clark has, as part of her five conditions, said there must be a world class spill response system. Enbridge responded by saying there will be. The province then turns around and says Enbridge has failed to do prove it. Because of the potential for spills, and their impact, NG has committed to develop a comprehensive spill response capability. Indeed, NG has stated that it intends to have a “world-class response capability” for the Project. Given the real potential for spills to occur, and the devastating effect of a spill should a significant one take place, the Province submits that NG must show that it would be able to effectively respond to a spill. As set out below, the Province submits that it has failed to do so. Again, the province appears to accept arguments from Douglas Channel Watch that Enbridge has underestimated the challenges of handling a spill in a remote area. The province also accepts the argument that booms are ineffective in high stream flow in the Kitimat River. As the JRP noted during cross examination by the Province of NG with respect to the Clore River, it has had the opportunity to take a view of the entire route. It will therefore know the steep and rugged terrain through which the pipeline would pass. If a spill were to occur during a period of high flow conditions, a common occurrence in British Columbia rivers, then some aspects of the response may have to be curtailed, or at least delayed until the high flow event recedes. At certain water velocities, booms become ineffective, and are potentially unsafe to operate. Many of these challenges are recognized by NG. In the Preliminary Kitimat River Drainage Area Emergency Preparedness Report (“Kitimat Report”), NG refers to the challenges of winter conditions, avalanches and debris slides, heavy snow, spring melt, Fall freeze-up, patchy ice, and fast-flowing watercourses. The province also accepts the argument that under some circumstances that diluted bitumen can sink, arguments raised by David Shannon of Douglas Channel Watch. Diluted bitumen emulsions will remain buoyant in waters with densities greater than approximately 1.015 g/cc. If the water density drops below approximately 1.015 g/cc,in zones of fresh-water intrusion, weathered and emulsified diluted bitumen products may sink to the depth where the density increases to above 1.015 g/cc. The weathered diluted bitumen would have a density approaching 1.0 g/cc, which indicates that once the diluted bitumen weathers it may be susceptible to sinking in fresh water. …submerged oil may eventually sink with increased weathering, if in receiving water with lower density, or if sufficient sediment is incorporated. On the other hand, another NG witness stated that dilbit cannot sink, as this would be contrary to an “immutable fact of physics”. In cross examination, Dr. Horn, Mr. Belore and other witnesses maintained that dilbit will only sink in the presence of suspended solids, or after a long period of weathering. underestimated in the provided scenarios. In the cases of both the Enbridge-Kalamazoo and the Kinder Morgan-Burnaby spills, significant oil-sediment interactions occurred. The changes to dilbit as it ages in the environment may affect cleanup. Although initially buoyant in water, with exposure to wind and sun, as well as by mixing with water and sediment in the water, the density of dilbit can increase to the point that the oil may sink. Recovery and mitigation options for sunken oils are limited. Not only has Environment Canada expressed the view that even small amounts of sediment may cause oil to sink, its witness also stated under cross-examination that high velocity rivers may carry high suspended sediment concentrations, and that, at certain times of the year, sediment load could enter the marine environment. Although NG acknowledges that sediment loads and oil-sediment interactions are a critical factor in predicting the behaviour of spilled oil, it has not, in Environment Canada’s opinion, provided a complete baseline data set on sediment loads, despite requests that such data be provided. While NG has submitted information respecting the laboratory testing of dilbit, an Environment Canada expert testified that tests conducted in a laboratory setting provide only limited information that cannot be relied upon in isolation to predict the fate and behaviour of hydrocarbons spilled into the environment. Instead, information gathered from real spill events must inform the analysis, and consideration must be given to the conditions, including water temperature, suspended sediment concentrations and wind speed, to be encountered in the “real world”. Environment Canada has also made it very clear that the evidence provided to date by NG does not allow for a full understanding of the behaviour of spilled dilbit. In the opinion of Environment Canada witnesses, the evidence has not provided sufficientclarity with respect to the weathering, evaporation or sedimentation processes dilbit may be subjected to in the environment. Given the unique nature of this product, further research is warranted before one can ascertain whether dilbit will sink or remain on the water surface. Those concerns were echoed by an expert retained by the Gitxaala Nation. There are no definitive statements in the [Environmental Impact Statement] EIS to explain if bitumen diluted with condensate will emulsify, sink or do both if spilled. The supporting technical data analysis in the EIS is based on laboratory tests. There are no in-situ field tests, empirical studies, nor real incidents to validate these findings. This raises significant uncertainty that current spill response technologies and equipment designed for conventional oil can track and recover the diluted bitumen in temperate marine waters. In essence, the assumption that the diluted bitumen can be recovered on-water has yet to be tested. In short, what dilbit will do when it enters water remains unclear. NG recognizes this lack of clarity itself. As was stated by one of its witnesses, “it’s extremely difficult to predict the behaviour of this product”. NG admits that additional research needs to be done with respect to understanding how dilbit behaviour. The Province has serious concerns about the lack of clarity and certainty about what dilbit will do if it were to enter the water, the preliminary and indeed contradictory nature of the evidence with respect to NG’s remediation strategies and actions to address sunken oil, and the fact that its proposed tactics have not been evaluated for use in British Columbia. These factors, taken together, suggest that, at least as of today, NG is not yet prepared to deal with sunken oil in the event there were a spill of dilbit into a British Columbia watercourse. By itself this is a cause for serious concern in relation to the fundamental question in this proceeding, namely whether the JRP should recommend approval of this project. But at the very least, this means that a strong condition must be imposed requiring further research on the behaviour of dilbit. Despite the challenges to responding to a spill from the pipeline, including the challenge of responding to submerged and sunken oil, NG’s plans for responding to a spill have not yet been developed. NG has committed only to providing its detailed oil spill response plans to the National Energy Board 6 months in advance of operations. In the context of this project, the Province remains very concerned that NG has not yet demonstrated its ability to respond effectively to spills from the pipeline. Of particular concern, despite its admission that a spill into a watercourse in a remote location would pose a significant challenge, NG has not yet determined those locations it could access to respond to a spill, including the control points utilized for capturing and recovering oil passing that location. Such access will only be determined, if possible, during detailed planning. At this time, NG also does not know what portion of water bodies would be boat-accessible in the event of a spill. The 2010 Michigan spill, which was the subject of much questioning during the hearing, occurred in a populated area, where there were many potential access locations. This will of course not be the case if a spill were to occur in a remote river in British Columbia. While NG has prepared a document showing some possible control points that might be used for spill response in the event of a spill in some rivers, NG concedes that its work in this regard is preliminary, and only pertains to some of the control points that would ultimately have to be established. NG helpfully provided additional information to that which was originally filed with respect to the travel distance between pump stations or the terminal and certain potential control points. However, travel times to the control points that have been identified do not take into account mobilization time, and assumes all roads are drivable. Given the incompleteness of NG’s evidence in this regard, the Province submits that NG cannot currently assert that there would in fact be viable control points where a spill could travel to. In addition, even if accessibility to control points had been fully validated, in order for NG to assert that it could respond effectively to a spill, it would also have to know the means by which personnel and equipment would gain access to respond to oil that had come ashore or sunken to the sediment. Given the preliminary nature of the evidence presented by NG, this is of course not known. The Province is very concerned that, in the event of a spill, some places where a spill could reach will be inaccessible, and therefore not amenable to spill recovery actions. While NG states that it will be able to access control points at any location along the pipeline, it has simply not provided the evidence in this proceeding to substantiate this assertion. The Province submits that, as of today, it is not possible for NG to assert, nor for the JRP to conclude, that NG will be able to access all those places where a spill may travel, and to respond effectively. Columbia in respect of which NG has completed only very preliminary work. • The pipeline could be covered by heavy snow at different times of the year; NG states that it will have to review alternative methods of access to deal with this, but has presented no specific evidence on how this challenge will be addressed. • NG has not yet developed specific plans about how it would deal with oil recovered from a spill, and has not yet determined disposal locations. • NG has not yet determined the location or the contents of the equipment caches to be used to respond to spills. • It has not determined year-round access to the pipeline, which will be evaluated as part of detailed planning. 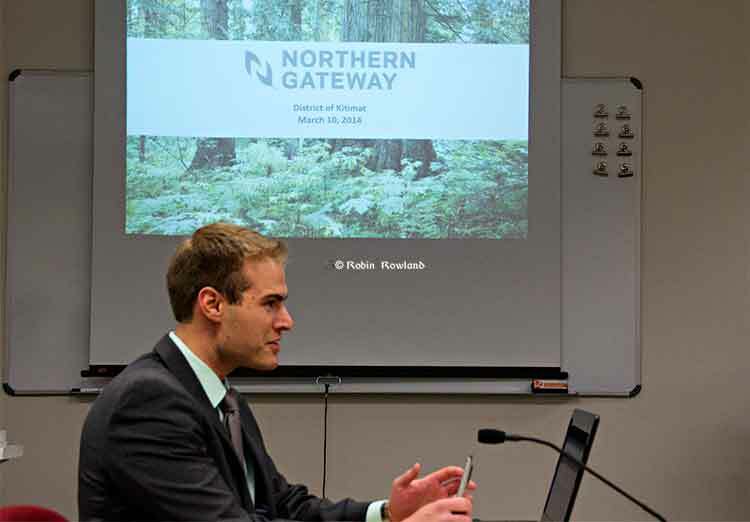 The province takes a harsh look at Northern Gateway’s plan for a response on the Upper Kitimat River and Hunter Creek. Based on water velocities, a release at this location could reach the Kitimat River estuary 60 km downstream within four to ten hours, depending on river discharge. Dr. Horn has indicated that these figures are very conservative, and that the actual times to reach Kitimat would be a longer period. However, no other definitive evidence on these times was presented by NG. The provincial argument goes over Enbridge’s spill record in detail, including the Marshall, Michigan spill which was harshly criticized by the US National Transportation Safety Board. Concerns about NG’s inability to respond to a spill are magnified by Enbridge’s conduct with respect to the spill which took place in Michigan. NG concedes that, in that case, there were procedures in place that were not followed. NG asserts that it now has in place a number of “golden rules”, including that whenever there is a doubt with respect to whether the spill detection system has detected a leak, the pipeline must be shut down. However, NG concedes that this rule was in place before the Michigan spill; it self-evidently was not followed. In fact, the rule under which Enbridge would shut down its pipeline system within 10 minutes of an abnormal occurrence which could be immediately analyzed was put into place following a spill in 1991. At that time, similar commitments were made indicating that procedures would change and that a spill of that nature wouldn’t take place again…. In short, if NG is relying on its ability to respond effectively to a spill for a positive recommendation from the JRP, then it must show that it will in fact have that ability. The Province submits that NG has not shown that ability in this proceeding. The Province submits that requiring NG to show now that it will in fact have the ability to respond effectively to a spill is particularly important because there will be no subsequent public process in which that ability can be probed and tested. NG has pointed out that its oil spill response plans will be provided to the NEB for review, and has committed to a third party audit of its plans. However, it also acknowledges that there will be no means by which those plans could be tested through a public process. The Province submits that the evidence on the record does not support NG’s contention that it will have a world-class spill response capability in place. The challenges posed by the pipeline route, the nature of the product being shipped, the conceptual nature of its plans to date and Enbridge’s track record mean that the Province is not able to support the project’s approval at this time. The Province submits that its concerns in this regard should be seriously considered by the JRP as it considers the recommendation it will be making to the federal government. Enbridge is striking back against the First Nations and intervenors who oppose the Northern Gateway pipeline and marine terminal projects by filing questions that those groups must answer as part of the Joint Review Process. On May 11, 2012, Enbridge filed questions with 24 organizations, and from the questions, it appears that Enbridge isn’t just building a strictly legal case in their favour but are preparing to try and discredit opponents. Enbridge’s questions are part of the legal process. For months, First Nations and intervenors have been filing a whole series of questions asking for clarification of items in the Enbridge’s filings on the project with Joint Review Process and Enbridge has the legal right to ask the First Nations and intervenors to clarify their positions. However, the difference is that Enbridge is a giant corporation which can afford to spend millions of dollars on both the approval process as well as the current nationwide advertising process, while some of the intervenors are made up of volunteers or retirees working on their own time. Sources among the intervenors have been saying for months that they believe that Enbridge is following a perceived policy of working to wear down the opponents so much they burn out and drop out of the process. A large proportion of the questions Enbridge is demanding that First Nations and intervenors answer are overtly political, rather than technical responses to their filings. Some key questions directed at both the Haisla and Wet’suwet’en First Nations seem to indicate that Enbridge is preparing to build both a legal and probably a public relations case questioning the general, but not unanimous support for liquified natural gas projects in northwestern BC, by saying “Why not Northern Gateway,” as seen in this question to the Haisla Nation. Please advise as to whether similar measures would be requested by the Haisla First Nation to deal with construction-related impacts of the Northern Gateway Project. A series of questions to the coalition known as the Coastal First Nations questions the often heard assertion that an oil spill on the BC coast is “inevitable,” and Enbridge appears to be prepared to argue that spills are not inevitable. Enbridge asks Coastal First Nations about a study that compared the bitumen that could be shipped along the coast with the proposed LNG projects. Please provide all environmental and risk assessment studies, including studies of “Black Swan” events, conducted by the Coastal First Nations or any of its members in respect of the LNG projects referred to. It is Black Swan events that most of the people of the northwest coast fear when it comes to all the major energy projects, but if as Taleb says they are hard-to-predict and rare, how can the studies Enbridge is requesting actually predict those disasters? Enbridge’s questions to the Haisla Nation runs for 28 pages and many of those questions are political, not technical, including asking for details of the Haisla support for the various Kitimat liquified natural gas projects and who may be funding the Haisla participation in the Joint Review Process. Many technical questions around the questions of “acceptable risk” and it appears, despite the fact Enbridge officials have listened to the Haisla official presentation at Kitamaat Village last January and the speeches of Haisla members this week at the pubic comment hearings, that Enbridge is preparing to use a paper-based or Alberta-based concept of acceptable risk as opposed to listening to the First Nation that will be most directly affected by any disaster in the Kitimat harbour or estuary. A series of questions seems to negate Enbridge’s claim that it has the support of many First Nations along the pipeline route because Enbridge is asking for details of agreements that First Nations have reached with the Pacific Trails Pipeline. Enbridge has consistently refused to release a list of the First Nations it claims has agreements with the company, but in the questions filed with the JRP, Enbridge is asking for details of agreements First Nations in northern BC have reached with the Pacific Trails Pipeline. Please confirm that the Office of the Wet’suwet’en has received participant funding from the Canadian Environmental Assessment Agency to participate in the Joint Review Panel (“JRP”) proceeding. Please advise as to the amount of participant funding received to date from the Canadian Environmental Assessment Agency. last 5 years from Tides Canada, the Gordon and Betty Moore Foundation, the William and Flora Hewlett Foundation, or any other similar foundations, to oppose the Northern Gateway Project or to oppose oil sands projects in general. If so, please provide the amount of funding received from each foundation. In the case of the Raincoast Conservation Foundation, Enbridge is asking for details, including a membership list. Please provide a description of the Raincoast Conservation Foundation. Does the Raincoast Conservation Foundation prepare Annual Reports? If so, please provide the most recently published Annual report available. If the Raincoast Conservation Foundation is a collection of like-minded individuals, please list its members. Did the Raincoast Conservation Foundation apply for and receive participant funding in this proceeding? If so, how much was received? Please confirm that the “What’s at Stake? 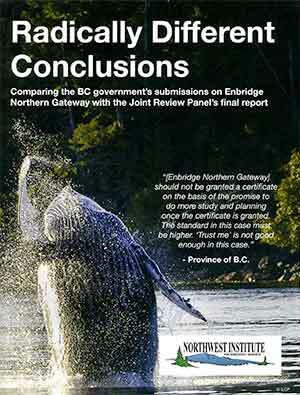 study” was prepared for use as a public relations tool, to advocate against approval of the Northern Gateway. 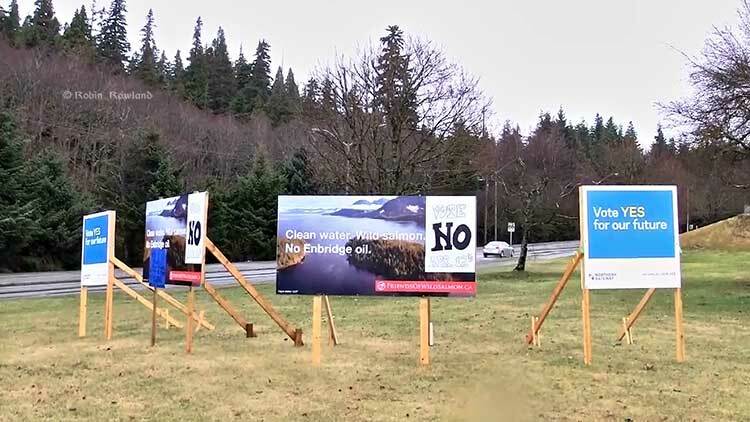 Enbridge also appears to be gearing up for personal attacks on two of the most vocal members of Kitimat’s Douglas Channel Watch, Murray Minchin and Cheryl Brown, who have been appearing regularly before District of Kitimat council to oppose the Northern Gateway pipeline. Written Evidence Regarding Proposed Liquid Petroleum Pipelines from the proposed Nimbus Mountain West Portal to the Kitimat River Estuary submitted by Murray Minchin of Douglas Channel Watch…. Supplemental Written Evidence Photographic Evidence Regarding Proposed Liquid Petroleum Pipelines from Nimbus Mountain to the Kitimat River Estuary submitted by Murray Minchin of Douglas Channel Watch…. Mr. Minchin provides extensive opinion relative to geotechnical and other technical matters. Request: Please provide Mr. Minchin’s curriculum vitae which includes his education, training and employment history, to demonstrate his qualifications to provide geotechnical and other technical opinions that appear…. 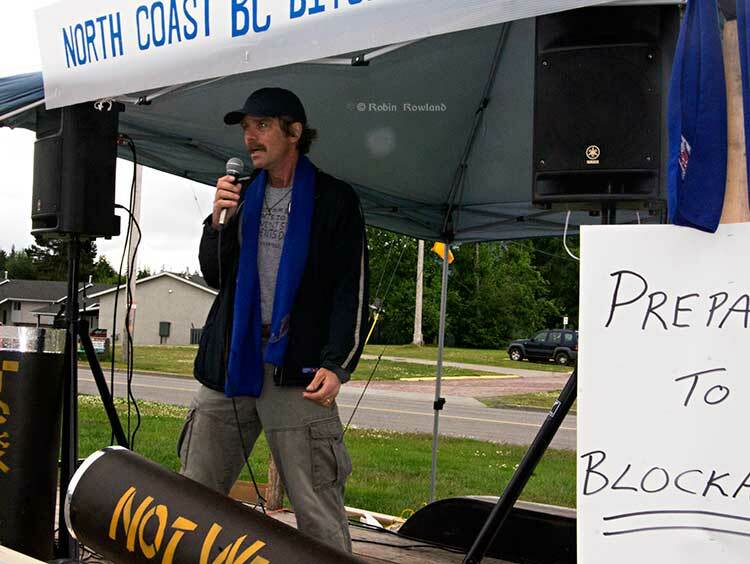 Minchin is one of Enbridge’s strongest opponents in Kitimat and in his various appearances (the latest at the anti-Enbridge demonstration in Kitimat on Sunday, June 24, 2012, Minchin has told the audiences that he is self-taught and has spent much of his spare time over the past few years studying the documents Enbridge has filed with the JRP. Has Ms. Brown offered a suggestion for a speaker that would have provided a differing viewpoint from those of Northern Gateway? Many people in Kitimat, not just the outspoken members of Douglas Channel Watch, say they do not trust the Community Advisory Board process. When the CAB held a meeting recently to discuss marine safety, a meeting that was heavily advertised in Kitimat Terrace area, the CAB facilitators ( from a Vancouver -based company) attempted to bar the media, including this reporter, from this “public” meeting, until apparently overruled by Enbridge’s own pubic relations staff. On the other hand, everytime Douglas Channel Watch has appeared before the District of Kitimat Council to request a public forum on Gateway issues, DCW has always insisted that Enbridge be invited to any forum, along with DCW and independent third parties. Ms. Brown states that Enbridge has not addressed the hard questions. Please confirm that Northern Gateway responded to questions put forth by the Douglas Channel Watch in Letters to the Editor in both the Kitimat Northern Sentinel and Terrace Standard in August of 2009. Here Enbridge appears to be basing its case on one letter to the editor that appeared in local papers three years ago. During the public comment hearings that the JRP held at Kitamaat Village earlier this week, numerous people testified time and time again that Enbridge was failing to answer major questions about the pipeline and terminal, by saying that those questions would be answered later, once the project is approved. Paragraph 2.2, indicates that the Kitimat Valley Naturalists has birding records for the estuary for over 40 years and that Kitimat Valley Naturalists visits the estuary at least 100 times per year. Paragraph 2.3 indicates the Kitimat Valley Naturalists have local expertise in birds of the Kitimat River estuary as well as other plants and animals that utilize those habitats. Request: To contribute to baseline information for the Kitimat River estuary and facilitate a detailed and comprehensive environmental monitoring strategy, please provide the long term database of marine birds in and adjacent to the Kitimat River estuary, with a focus on data collected by the Kitimat Valley Naturalists in recent years, and where possible, the methodology or survey design, dates, weather and assumptions for the data collection. these bird counts are available on the web or in print form. Historical results for CBC counts have also been published by the journal American Birds. The earliest CBC count for Kitimat was 1974. In regard to the long-term database, we have significant numbers of records for the foreshore of the Kitimat River Estuary. The number increases when the larger estuary perimeter is considered. These cover a 40-year period with the majority in the last 20 years. We would be willing to provide this information in a meaningful format. The Kitimat Valley Naturalists, however, lack the expertise or financial ability to convert the data into a format that would address Northern Gateway’s interest in methodology, survey design, dates, weather, and assumptions for data collection. Alternatively, we do have access to a consulting firm, which is willing to analyze our data and convert it to a useable and practical design. We assume, since this is a considerable undertaking in both time and cost, that Northern Gateway would be willing to cover the associated fees. We look forward to hearing back from Northern Gateway and pursuing this with a budget proposal. Northwest Coast Energy News consulted data management experts who estimated that complying with the Enbridge request would likely cost between $100,000 and $150,000. Some Wet’suwet’en houses have opposed the Pacific Trails Pipeline, and while negotiations with Apache Corporation are continuing, Enbridge is asking the First Nation for details of what is happening with that pipeline. Is it the position of the Office of the Wet’suwet’en that each First Nation whose traditional territory is traversed by the proposed pipeline has a veto on whether it is approved or refused? Please confirm that the Office of the Wet’suwet’en opposed approval of the Pacific Trails Pipeline (also known as the Kitimat Summit Lake Looping Project). Does the Office of the Wet’suwet’en continue to oppose construction of the Pacific Trails Pipeline? Have the First Nations who are proposing to participate as equity owners in the Pacific Trails Pipeline Project advised the Office of the Wet’suwet’en that they accept that the Office of the Wet’suwet’en has a right to veto approval and construction of that Project? The majority of questions filed with the Coast First Nations are technical challenges to studies filed by the coalition. Enbridge also filed questions with the Gitga’at, Gitxaala, Heiltsuk Nations and the Metis Nation of Alberta. Kitimat is getting ready for the next round of Joint Review hearings in the district on the Enbridge Northern Gateway project. The JRP is scheduled to hold the ten minute comment hearings at the Haisla Recreation Centre on the afternoon of June 25 and 26. The hearings scheduled for June 27 have been cancelled because, the JPR says: “The number of registered participants does not require the hearing session on 27 June.” As with other locations, it appears that many people are dropping out of the hearings because given Prime Minister Stephen Harper’s determination to push through the pipeline no matter what and they feel their voices will not matter. On Monday night, June 18, the District of Kitimat Council approved a request from Douglas Channel Watch for a protest rally to be held Sunday, June 24, at 2 p.m. in the lower parking lot at City Centre Mall. The application to the council said that a number of speakers will also address the issue of the government’s omnibus Bill C-38. 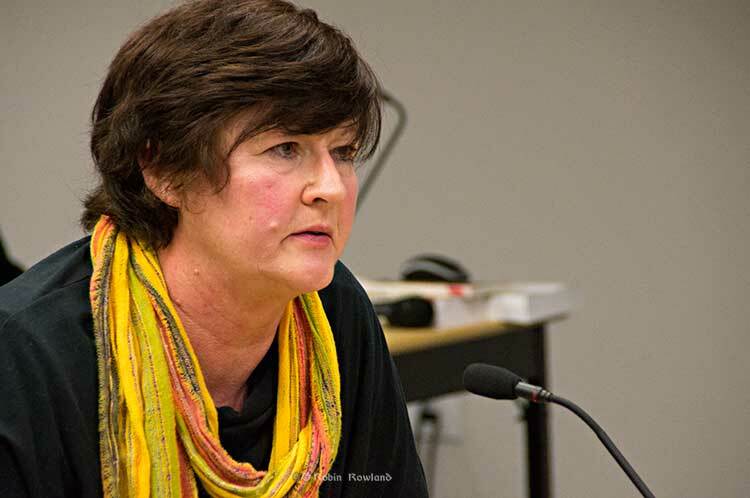 Margaret Ouwehand of Douglas Channel Watch, also noted in her application, “we wish to have a short march where participants would walk on sidewalks and obey all traffic signals.” In the report on the application, District staff noted that under the BC Municipal Code, a march of more than 30 people is considered a parade and in the case of Kitimat would also require the permssion of the local RCMP. The protest rally is being heavily promoted on Twitter and Facebook as well as more traditional media, so it is likely that there will be more than 30 people participating in the rally and march. At the same time, some members of the federal NDP caucus will be in Kitimat for the second day of the hearings. A release from the NDP says Deputy Leader and Environment Critic Megan Leslie will lead the delegation to the northwest. The NDP Enbridge tour begins on Monday, June 25 with events and a public forum in Vancouver, a clear attempt to gain major media attention there, especially in an era where budget-strapped news organizations are always reluctant to send people to Kitimat. Leslie and Cullen will then lead a smaller delegation to meet with Haisla Chief Councillor Ellis Ross and will tour a portion of the proposed marine route that oil supertankers would take to transport raw bitumen to Asia from Kitimat. As well as attending the JRP hearings at Kitamaat Village, the NDP caucus plan to meet with local muncipal leaders in Kitimat as well as municipal officials and First Nations leaders from other communities. “I’m really looking forward to key members of our Opposition caucus meeting with people who are directly affected by Enbridge,” Cullen said in his news release. “Having taken part in dozens of Enbridge rallies and meetings over the years, I know there will be many very powerful moments. It’ll be pretty up front and personal. Terrace mayor Dave Pernarowski and perhaps members of other local councils will make a welcoming statement, followed by an address from MEgan and then an information session with presentations from individuals & organizations, followed by a question and answer session and break-out groups for those interested. With the June 27 JRP hearings now cancelled, there may be a second public meeting in Kitimat that afternoon starting at 12:30 p.m. but that is yet to be confirmed. Coastal First Nations have filed a notice of motion with the Northern Gateway Joint Review Panel, which, in effect, would compel the province of British Columbia to participate in the proceedings considering the future of the controversial Enbridge Northern Gateway pipeline project. So far the province, from Premier Christy Clark and Environment Minister Terry Lake down to the lawyer representing the province at the JRP, Christopher Jones, have refused to take part. A 30-page technical report containing the B.C. government’s assessment of the proposed Northern Gateway project sits on Environment Minister Terry Lake’s desk. Still, his government remains silent on the plan to build a pipeline across northern B.C. to get Alberta oil to Asian markets. newspaper on Sunday June 3, 2012.
or assessments it has done on the Project. any evidence filed by the Province of British Columbia. intends to consult with First Nations on the Project, and if so, how and when? The motion was filed June 8, but only posted recently on the JRP website. Three days later, on June 11, Jones, representing the province, filed the latest letter refusing to take part in the JRP proceedings. Since all filings are sent to intervenors and government participants, it is likely that the provincial ministry of Justice in Victoria was aware of the motion from Coastal First Nations. The province is yet to file a response to the motion. Earlier, on May 28, the province filed a notice with the Joint Review Panel, refusing to answer questions from the Kitimat environmental group, Douglas Channel Watch. If the Joint Review Panel does compel British Columbia to release documents and therefore participate in the hearings, it would make the Northern Gateway issue even more front and centre in provincial politics, something Premier Christy Clark, who is in trouble in the polls, has been trying to avoid. any evidence with the JRP. The Province of British Columbia has prepared a technical report containing the B.C. pipeline (transmission pipeline)] is a reviewable project under the B.C. amendments up to B.C. Reg. 4/2010, January 14, 2010]. The Project has the potential to significantly affect in an adverse manner the interests of CFN and its members’ Aboriginal Rights and Title. potentially affected by the Project. the Project including Crown tenures and leases. 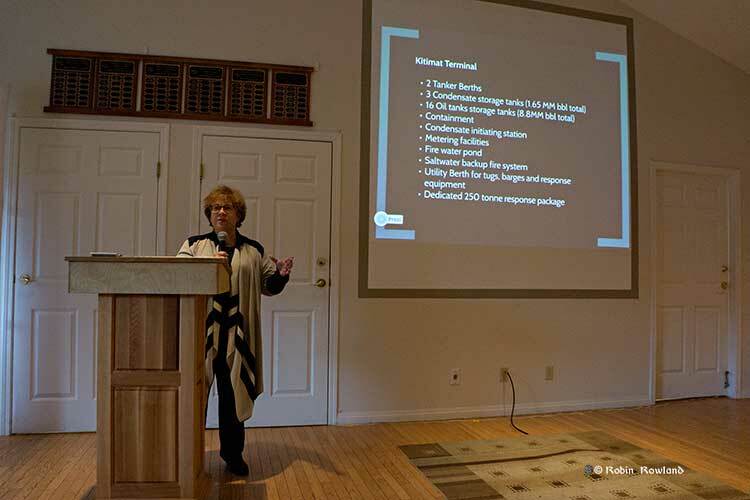 coordinated programs for oil pollution prevention, abatement, and response. assessments it has done on the Project. evidence filed by the Province of British Columbia. intends to consult with First Nations on the Project, and if so, when? The province of British Columbia has told the Northern Gateway Joint Review that it will not provide witnesses for cross-examination during the questioning phase of the hearings. The letter means that the province still has no input into the process concerning one of the largest industrial projects in BC history. B.C.’s environment minister acknowledges he’s feeling the pressure to take a stand on the proposed Northern Gateway pipeline project, but he says his government is determined to keep quiet until federal environmental reviews are completed. Environment Minister Terry Lake said Thursday the province’s silence on the pipeline decision created a demand for clarity that the government was willing to withstand. On Monday, Global TV’s Keith Baldry asked premier Christy Clark why the province is keeping out of the Joint Review Process. In her response, Clark repeated the provincial position that her government would not take a position on the pipeline and tanker project until the conclusion of the JRP. (Video of the item is not on the Global website). In late May, the province told the Joint Review Panel it would not provide answers to questions from the Kitimat environment group Douglas Channel Watch about items that DCW felt was in provincial jurisdiction.